The discussion goes back some 6 years, when I’d first started setting up my data and management consultancy practice. Since I’d freshly quit my job to set up the said practice, I had plenty of time on my hands, and the wife suggested that I spend some of that time learning astrology. Considering that I’ve never been remotely religious or superstitious, I found this suggestion preposterous (I had a funny upbringing in the matter of religion – my mother was insanely religious (including following a certain Baba), and my father was insanely rationalist, and I kept getting pulled in both directions). Now, the wife has some (indirect) background in astrology. One of her aunts is an astrologer, and specialises in something called “prashNa shaastra“, where the prediction is made based on the time at which the client asks the astrologer a question. My wife believes this has resulted in largely correct predictions (though I suspect a strong dose of confirmation bias there), and (very strangely to me) seems to believe in the stuff. “What’s the use of studying astrology if I don’t believe in it one bit”, I asked. “Astrology is very mathematical, and you are very good at mathematics. So you’ll enjoy it a lot”, she countered, sidestepping the question. I was stumped (ok I know I’m mixing metaphors here), and that had ended the discussion then. Until I decided to bring it up recently. As it turns out, once again (after a brief hiatus when I decided I’ll do a job) I’m in process of setting up a data and management consulting business. The difference is this time I’m in London, and that “data science” is a thing (it wasn’t in 2011). And over the last year or so I’ve been kinda disappointed to see what goes on in the name of “data science” around me. This XKCD cartoon (which I’ve shared here several times) encapsulates it very well. 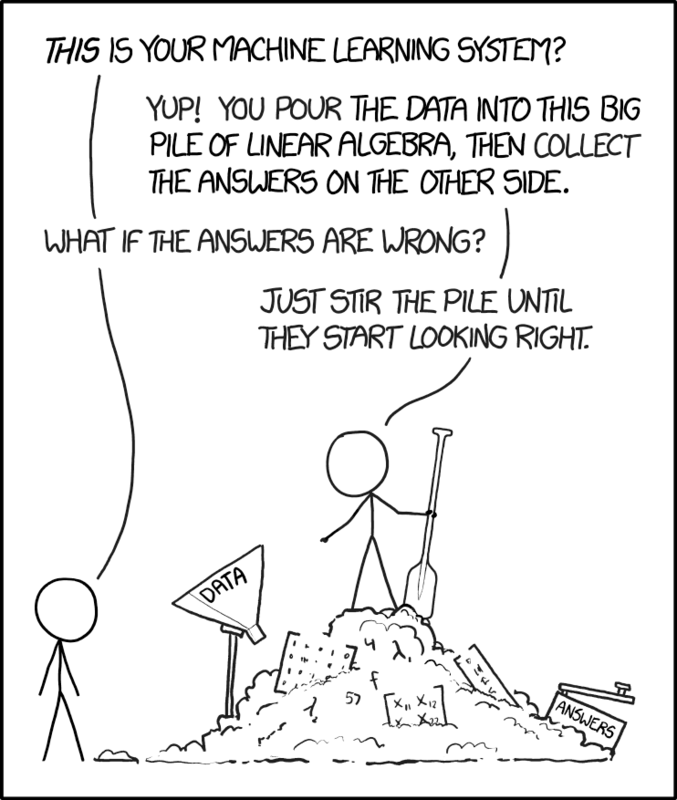 People literally “pour data into a machine learning system” and then “stir the pile” hoping for the results. In the process of applying fairly complex “machine learning” algorithms, I’ve seen people not really bother about whether the analysis makes intuitive sense, or if there is “physical meaning” in what the analysis says, or if the correlations actually determine causation. It’s blind application of “run the data through a bunch of scikit learn models and accept the output”. And this is exactly how astrology works. There are a bunch of predictor variables (position of different “planets” in various parts of the “sky”). There is the observed variable (whether some disaster happened or not, basically), which is nicely in binary format. And then some of our ancients did some data analysis on this, trying to identify combinations of predictors that predicted the output (unfortunately they didn’t have the power of statistics or computers, so in that sense the models were limited). And then they simply accepted the outputs, without challenging why it makes sense that the position of Jupiter at the time of wedding affects how your marriage will go. So I brought up the topic of astrology and data science again recently, saying “OK after careful analysis I admit that astrology is the oldest form of data science”. “That’s not what I said”, the wife countered. “I said that data science is new age astrology, and not the other way round”. Having implemented this to various degrees of success over the last 5-6 years, I propose a small correction – basically to follow the second strategy that Adams has mentioned, you need to take correlation into account. Basically there’s no joy in becoming very good (top 25%) at two or more correlated things. For example, if you think you’re in the top 25% in terms of “maths and physics” or “maths and computer science” there’s not so much joy because these are correlated skills. Lots of people who are very good at maths are also very good at physics or computer science. So there is nothing special in being very good at such a combination. Why Adams succeeded was that he was very good at 2-3 things that are largely uncorrelated – drawing, telling jokes and understanding corporate politics are not very correlated to each other. So the combination of these three skills of his was rather unique to find, and their combination resulted in the wildly successful Dilbert. So the key is this – in order to be wildly successful, you need to be very good (top 25%) at two or three things that are not positively correlated with each other (either orthogonal or negative correlation works). That ensures that if you can put them together, you can offer something that very few others can offer. Then again, the problem there is that the market for this combination of skills will be highly illiquid – low supply means people who might demand such combinations would have adapted to make do with some easier to find substitute, so demand is lower, and so on. So in that sense, again, it’s a massive hit-or-miss!